'Fruit' 태그의 글 목록 :: Food Storyist. 2012.02.19 Korean Fruit : Winter Strawberries in Season? 2011.12.22 Korean Food : The Most Popular Fruit : Do Koreans Eat a Box? 2011.12.20 Korean Food : Why is Korean Persimmon so Special? Korean Fruit : Winter Strawberries in Season? Mom and I went shopping to the grocery store. Recently I kept eating fast food or instant meal, and I lacked vitamins on my diet. I needed some fruit to get deficient nutritions. So, we walked to the fruit section. Suddenly, I recalled the time I had an activity of picking strawberries in Australia. But it was in early summer, or maybe in late spring. I wore a short-sleeve shirt and short pants. I sweated on the forehead underneath my cap, squatting along the strawberry bush, under the scorching sun. But here in Korea, Winter strawberry?? “Mom, are strawberries in season now?" I asked to mom with a inquisitive look. Mom seemed puzzled at first by abruptness and started pondering for a while. I nodded, grinning. I heard of green house fruits from news. But why did they do that? Mom again fell into her thought, with her eyes rolling. She took some time to arrange her answer and opened her mouth. The answer was as clear as my mom’s personality. I understood what she explained, but still I had a quizzical thing in the head. I hastened to ask mom without any paused moment. Because I was afraid that mom felt bothered by my subsequent questions. Mom smiled to me as if she treated a small child. In fact, I was so curious like a little kid who continued asking her mom countless questions. Mom and I came home with plastic bags on both hands. Yes, also with a box of strawberries. Putting stuff to its right place, I realized this. Recently I kept watching comedy or meaningless dramas, and I lacked requisite study in my life. I thought I needed not only some fruit, but also knowledge to nourish my brain. So, I walked to the book shelves. According to a research from Rural Development Administration, the winter strawberry gives 12.5 Bx of sweet level, comparatively spring one gives 10Bx. In addition, The acidity of winter strawberry is 0.7%, while That of spring one is 1%. I went to Sajik farmer's market with my mom and sister. We need ricke cake and some fruit. We were able to buy them at the discount store. But we all like walking through the market feeling the lively atmosphere. Just Like a little me. First, We looked for our first target, rice cake. There were several rice cake stores. But this store seems to sell the freshest rice cake just out of the steamer. Also, it was so very crowded by a throng of people. Next, we bought sweet rice drink called 'Sikhye'. but this year, she is not healthy enough to do it, sadly. I am not that fond of it, so I didn't notice there were no sikhye prepared. My sister reminded us of the tradition of drinking sikhye. Mom and I first hesitated. Mom is not a big fan of sikhye, either. But Sister wanted to buy it for visitors and for herself. we found the fruit store with vivid, luminous colors of fruits. that's usually sweeter than others. I feel like I have already eaten 10 kgs of it this winter. But I want to eat it more and more. I am crazy for a mandarine. Mom also bought a few pears. Pears ripens and get harvested in autumn, so it's not in season now. But it is one of food used in the ancestral rite at the new year. So, in spite of its high price, Korean buy pears every traditional holiday. Now, we are almost prepared for welcoming relatives. BTW, Ladies and Gentlemen! Happy New Year! This is one of my favorite drink in Korea. From the past, Korea has made Fruit drink such as umes, strawberries and so on. Ume is the most popular one of them. Lotte company produced a commodity of it. It has two variation including Seoljungmae gold and Seoljungmae Sparkling. It 's a very Korean drink, so you shouldn't miss it! Enjoy it with fried meat like pork or beef! You should try with orange juice. It tastes good mixed. And people usually drink this in Soju glass. I tried something different and it made good mood anyway. Korean Food : The Most Popular Fruit : Do Koreans Eat a Box? Do Koreans eat a mandarine box? Yes, that’ right, but it’s metaphor. Koreans eat a box of the mandarine every winter. According to the Korean agriculture institute, the mandarine is announced as the No.1 consumption per capital with the record of 15.4kg per person. It follows with the apple with 9.9kg and asian pear with 8.0kg. There is the huge consumption gap from the no.2, apple. The more surprising fact is that it occurs only in winter, the limited season. When Koreans buy mandarines from the supermarket, we don’t buy few kilograms of the plastic bag. We usually buy a 10kg of box or order a heavy box through the internet. Then, we enjoy mandarines as they want. Korean often says that I ate one box of mandarine for few days and my fingers turned yellow. we eat the huge amount of mandarine just peeling them by hands. We don't cook or use them in the dish. We eat them just raw and fresh. As peeling it with their finger, the juice of it colors all finger-tips and nails. Some people time to time show off their hand to friends as if they want to prove their saying. Koreans love to eat mandarines. and dye your fingers with yellow. Korean Food : Why is Korean Persimmon so Special? I definitely come up with this. This is a Gam 감 tree. Do you happen to know what the Gam is? No clue? Someone might think it looks like a Persimmon tree or Kaki tree. I would say yes and also no. Because I believe that Korean Gam is different from other persimmons around the world. For the one who does not know what the persimmon is, I give you brief introduction of this, but by supported by Mr.wikipedia. Before meeting him, I should inform you of the saddest fact about the name of the variety. Yes, feeling sorry for our Korean Gam, it is classified as a Japanese persimmon by Mr.Wiki. Haha. But In case of your curiousity, I give you Gam info through this. Diospyros kaki, better known as the Japanese Persimmon, Kaki Persimmon (kaki [柿]) or Asian Persimmon in North America, is the most widely cultivated species of the Diospyros genus. Although its first published botanical description was not until 1780, the kaki is also among the oldest plants in cultivation, known for its use in China for more than 2000 years. The persimmon (kaki) is a sweet, slightly tangy fruit with a soft to occasionally fibrous texture. This species, native to China, is deciduous, with broad, stiff leaves. Cultivation of the fruit extended first to other parts of east Asia, and was later introduced to California and southern Europe in the 19th century, to Brazil in the 1890s, and numerous cultivars have been selected. A variety is Diospyros kaki var. sylvestris Makino. In many cultivars, known as the astringent varieties, the fruit has a high tannin content which makes the immature fruit astringent and bitter. The tannin levels are reduced as the fruit matures. It is not edible in its crisp firm state, but has its best flavor when allowed to rest and soften after harvest. It has a delicious soft jelly-like consistency, and is best eaten with a spoon. The Japanese cultivar 'Hachiya' is a widely grown astringent cultivar. Some cultivars, such as Fuyu, do not contain tannins when firm, and can be eaten like an apple, or can be allowed to go to any stage of ripeness, including to the jelly-like stage. These non-astringent varieties are considered to have a less complex flavor. You could not have eaten Gam (Korean persimmon) throughout your life, but it is not that surprising to me. Because 90% of the production of Kaki are made from East Asia ; China, Japan and Korea. I do recommend you try to taste these sweeties in fall. The Gam usually gets ﻿harvested between October and November, so it is proper season to try it. I have two Gam trees at home. I used to break the branches with some ripe Gam on in autumn and bring them to my school to decorate my classroom. I got some compliment from my teacher that I brought the autumn atmosphere to my classmates. I tended to feel proud of my Gam branches. In my village, especially my neighborhood, some houses have Gam trees and they distribute or exchange Gams to neighbor to express their affection to each other. Still, they do and I appreciate that. As you can see here, I do have a number of memories with Gam since I was young. If your Korean friends live in the suburb or has relatives living there, they might have some stories or memories about Gam. Because In the southern rural areas in Korea, It is not that rare to have persimmon trees in the garden. Korea has three major varieties of persimmon ; there might be more than 20 varieties but they do not account much, so I just omit them. Fuyu persimmons (DanGam 단감) : distinguished by their "flat" bottoms and squat shape. Fuyus should be more orange then yellow and are at their best when just barely a teensy bit soft. They will ripen after picked, so buying rock-hard fuyus and allowing them to ripen at home can be a good strategy. Fuyus are commonly eaten raw, often sliced and peeled and salads. They have a mild, pumpkin-like flavor. Hachiya persimmons (Hongsi 홍시) : mouth-puckeringly tart unless absolutely, supremely ripe. Ripe hachiyas are unbelievably soft - and are often almost liquified into a silky smooth pulp inside. They are elongated and oval shaped. They will ripen once picked, so you can let them soften on the kitchen counter until ready to use. Bansi 반시 : One of the most famous products among the delicious Hongsi, the fully mellowed ripe persimmons is a seedless, flat Hongsi called Bansi. For the nutiritional facts, it is recommendable to eat the Gam. It contains sufficient amount of vitamin A, C, also high in fiber and other numerous health-benefits. They are used as the remedy for stomach ailments and diarrhea. It also lowers the blood pressure and relieve a cough. When you travel to Korea or try to stay long in Korea, I tell you to visit Chungdo(Cheongdo), Gyeoungsang province. It is the one of the two well-known local areas, the other is Sangju. 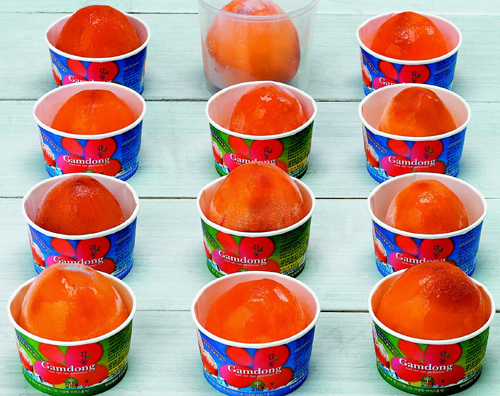 Chung do flat persimmon takes up about 20% of the national persimmon production amount. Chungdo is famous for Bansi 반시 named after the shape of portable dining table; Ban in Korean. You can see hundreds or thousands of Gam trees on the street while driving, riding or walking in Cheongdo. Especially when those trees combine with korean traditional country-houses, it creat heavenly beatiful natural scenery. Moreover with the red and yellow leaves of maple and Ginko trees, it bangs your heart. You must not miss it if you stay in Korea in the month of October and November. Chungdo Gam tries to differentiate their products from other places and make the Gam brand. To creat something new, they made diverse version of Gam, such as a Iced Hongsi called Gamdong. Why is Korean Persimmon so speacial? The taste is the best. ﻿﻿As there exist hundreds cultivars of persimmon and all have different tastes and textures. Above them, Korean persimmon as loved fruit among Koreans has been improved and developed to a valued producted. Korean proudly show our persimmon to world market. It recieved pretty good attention from the world. Also, it goes with Korean life. I live on the Korean home and streets, also stay alive within Koreans' memories. You can have pretty good story-nibblings with Korean friends while eating them. You also can hear Korean say the life is so bitter like an astrigent persimmon or so sweet like Fuyu(Dangam) or Hashiya(Hongsi) persimmon. you must try Korean persimmon.